Bergen is the only genuine medieval city in Norway. In spite of the fact that its wooden houses have been devoured by flames many times, the latest being by the large fire of 1702 the city has been rebuilt over and over again along the same old narrow streets and passages. Among the most beautiful areas is Bryggen, rebuilt after the last large fire, it still reflects centuries of building tradition. Not only the houses, but the people and the nature. Situated by a natural harbour, and enclosed by high hills and mountains. Lush, due to the large amount of rain that falls during the year. The city quarters that climb up along the hillside providing the tourists with breathtaking views. The numerous varieties of rhododendron in bloom in yellow, red, purple, and champagne colours. The lively, spontaneous population proud of their city and its past makes you feel especially welcome. And the abundance of food offered from a large range of restaurants. 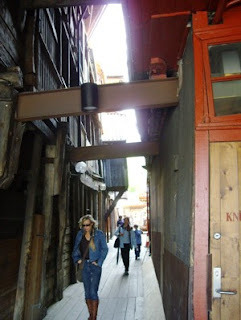 I have roamed the streets of Bergen last week, admiring its medieval past, eaten great food and had a great time. So I would like to present my memories to you the coming week.